Past. Present. Future. Time – or rather, the passage of time – is an utterly amazing phenomenon that we truly know very little about. We can count and capture the spaces between moments, and we understand it the only way we can – linearly. What if there’s more to time than that? What if existence has a deeper connectivity, one that we are blind to from our mortal, second-to-second vantage point? New York indie pop artist Conversing With Oceans’ debut EP Past. Present. Future. reexamines our perception of life through soaring, dreamy landscapes and the steadfast conviction that there is more to this world than meets the eye. Deeper than my heart. Deeper than my soul. Deeper than the words you were born to know. Deeper than my blood. Deeper than my bones. That’s how my love goes for you. 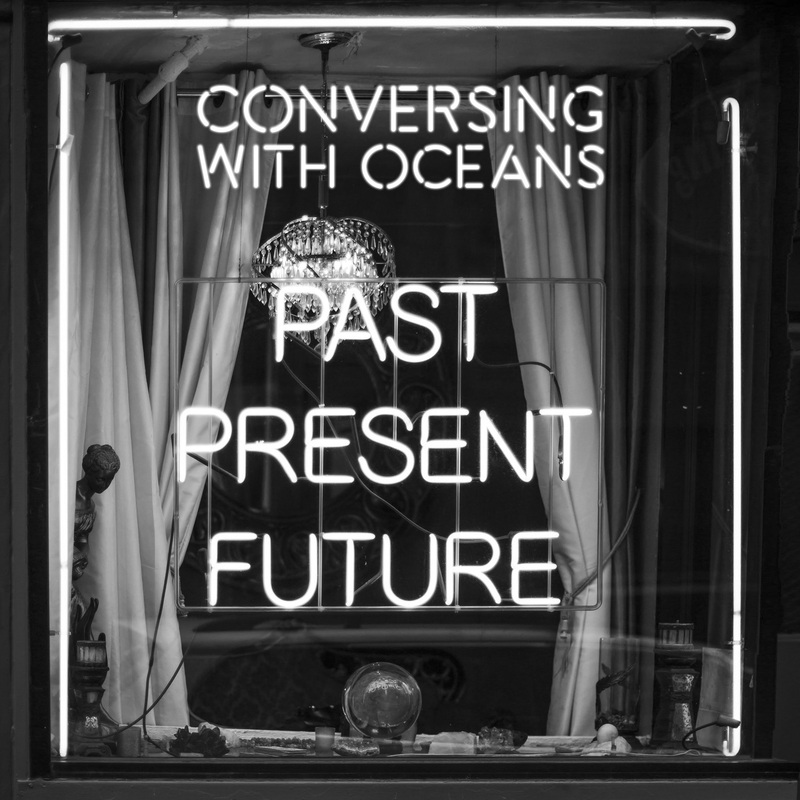 Atwood Magazine is proud to be premiering Conversing With Oceans’ Past. Present. Future., out November 25, 2016 (distributed via The Orchard). The moniker for New York-based Alex Bondarev, Conversing With Oceans feels free of boundary and restraint. The EP is a journey of self-awareness and awakening, its music openly searching for the new and the undiscovered within and surrounding. The epic moments are epic; the introspective moments quiet and reflective. Bondarev seems to question the meaning and significance of life at least once on each of the EP’s five tracks, balancing the often light-weighted nature of his music with the heavy weight of his words. “Past. Present. Future. combines all aspects of time, while my name (Conversing With Oceans) combines locations,” explains Conversing With Oceans. “It’s a coming together of time and space. Also, the songs progress from a starting place of past conflict (“A Spotlight on 3rd”) to current love (“The Gold Rush” and “Deeper”) to a place of future inclusion of others in that love (“Heart of a Poet”, “The Dream”). Finally, ‘The Dream’ is the only full-band song on this EP and my next EP will be more of a full-band sound.” Just like an artist to never be satisfied – to already have eyes on what’s next. Bondarev’s presentation makes total sense: His EP brings him out of memory and into the now, and then past the now and into the future. In an effort to observe the totality of a subject – whether we label that subject “existence,” or “time,” or “life” – Conversing With Oceans builds a fully immersive narrative. I got the book you recommended. I lied the first time you had asked. I thought of you as I unpacked it and all our talks on philosophy and silly things like that. And what it means to live, what it means to give a worthwhile kinda life. You know I still forget what a tender gift we get in this worthwhile kinda life. Conversing With Oceans takes the best of indie pop, molding poppy beats and gleaming synths with dense, rhetorical questions masked in everyday conversations. Whether it’s the head turning push-and-pull of “The Gold Rush” or the repeated motifs in “Deeper” and “Heart of a Poet,” Conversing With Oceans’ offering is both catchy and deep, an accessible record drenched in personal stories and searches. Alex Bondarev is still sorting life out, but his ability to openly ponder the world around him his laudable: Few artists can so humbly lay their gold and ghosts on the table, for all to appreciate. From memories to dreams, Conversing With Oceans attempts to disrupt the natural order of life; this EP exists not for a singular moment, but for all moments of reflection, contemplation, and meditation. Experience Past. Present. Future. via our stream, and peek inside Conversing With Oceans’ EP with Atwood Magazine below as the artist provides his personal take on the individual songs. “A Spotlight on 3rd” is about a dream-like scene of conflict, confusion, and ultimately of hope. I think about it as a photograph, a snapshot in time of an evening in the city painted with words. “The Gold Rush” is an homage to the silent film era and the romantic, cinematic love so many of those films captured. Each love story was (especially the old Chaplin movies) were these epic adventures. I think there are elements of that in our everyday lives too if we look for them. “Deeper” is a song about universal love. I think when we really think about love’s evolution, it doesn’t have to stop inside our homes and with our families. It’s an integral aspect of all facets of life. Deeper is about recognizing that “there is no ‘other'” as John Forte states. “Heart of a Poet” is a tribute to a dear friend lost to cancer. But it’s also about looking forward to building the kind of life he’d lived. I think the loss of loved ones makes you think a lot about the future and deeply affects the decisions you make now. “The Dream” is exactly that. I had this dream one night, woke up at about 3 AM and wrote it down in my journal scene by scene as I’d remembered. It became this song. I’m still making sense of it. Today, I mostly view it as a cautionary tale, but also as one of hope. That we’ll survive, or rather thrive, in seeing ourselves in one another.